God is calling us out to the deep. As you draw near to God, He will draw near to you. May you be saturated, transformed and empowered to live the life you were destined and created to live in His Glory! 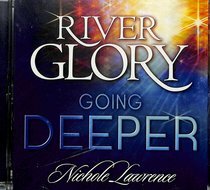 This CD creates an Atmosphere where you can go deeper into the river and encounter greater dimensions if intimacy, revelation and transformation through the Holy Spirit. 2 Cor. 3:18 says, "And we all who with unveiled faces contemplate the Lord's glory, are being transformed into his image with ever-increasing glory, which comes from the Lord, who is the Spirit"
About "River Glory - Going Deeper"
Nichole is an ordained minister with a psalmist anointing and a Supernatural Sound from Heaven anointed with power for breakthrough, deliverance, emotional and physical healing, prophetic revelations.